By the sheer Power of Name numerology various people throughout the world had perfect names to match their day, life, and lucky numbers. Numbers and alphabets are closely related to success. This was revealed by many great thinkers and men of importance. According to numerology the sound effects of your name produce certain patterns and expectations. The first name is more important in close relationships, while the full name is more important for official papers and wherever used. For better combination with psyche and destiny numbers it may be sometimes advisable to change ones name or nickname. Name numerology is the most important in relationships with others. Indians stand out as masters of the occult sciences mainly the astrology and the name numerology. Their discoveries have also been proved as hundred percent correct by modern scientists. Also By examining numerological compatibility between two people with the name numerology reading we can determine how compatible they are in terms of their personality, their abilities and their values. The data gathered with this numerology reading can predict with incredible accuracy if their relationship will be successful or not. 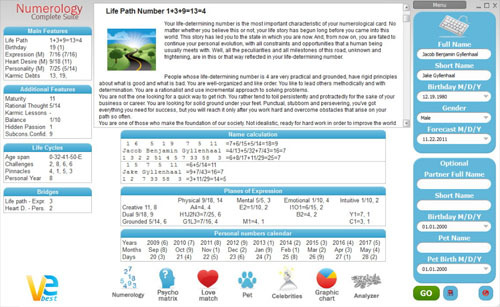 Finding out your personal numerology numbers will give you a tremendous insight into your true personality, strengths, weaknesses, your future and your abilities. Knowing these things can change your life for the better much, much quicker than merely going through life learning from your mistakes. You know what to expect and can therefore prepare for life much better.